Abruptio placentae is one of the dreaded cause of antepartum hemorrhage complicating 0.5-1 % or 1 in 200 pregnancies. The symptoms of abruption can mimic preterm labor or the process if chronic can be asymptomatic thus making clinical judgment the mainstay in diagnosis of majority of the cases. Here we present a case of chronic abruption who presented as a case of threatened preterm labor. A routine ultrasonography (USG) detected a retroplacental clot and finally intraoperatively couvelaire uterus was seen confirming the diagnosis. 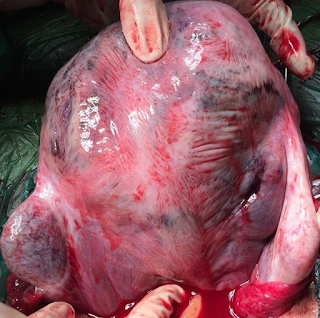 Abruptio placentae is defined as the premature separation of partial or complete placenta after 20 weeks of gestation any time before the delivery of the fetus. Abruption can either be revealed or concealed with bleeding seen per vaginum or as a retroplacental clot respectively. According to the severity of the presentation, abruption can be acute or chronic with the diagnosis of chronic made, as in our case, by USG. As the symptoms of chronic abruption are very non-specific, good clinical judgment and diligent fetal monitoring is needed to prevent the maternal and fetal morbidity and mortality that may result otherwise. A 27 year old G4A3 at 34 weeks of gestation with bad obstetric history was referred to our hospital as a case of threatened preterm labor with breech presentation. On admission, her general condition was fair and vital parameters were stable with a pulse of 86/ min. and BP of 120/80 mm of Hg. There was no pallor, icterus or pedal edema. She was complaining of intermittent abdominal pain, but there was no vaginal bleeding and she was perceiving fetal movements well. On per abdominal examination she was 34 weeks, but the presentation could not be made out. Uterus felt a little tense but was not tender and there were no uterine contractions. On per vaginum examination os was closed, posterior and tubular. There was no show or bleeding. She was already on oral Aspirin and intramuscular depot progesterone support in view of bad obstetric history from the first trimester of her pregnancy. She also gave history of admission 5 days back in a tertiary care center in view of decreased fetal movements. She was given complete dose of parenteral steroids for fetal lung maturity. Her serological and biochemical investigations were normal. Her USG was suggestive of single, live gestation of 32 weeks, a fundo-posterior placenta, no retroplacental clots and the fetus in transverse lie. She took discharge against medical advice and presented 3 days later again with pain in abdomen to a primary health care facility who referred her to our tertiary care hospital. Figure 1: Anterior surface of the couvelaire uterus. Figure 2: Posterior surface of the couvelaire uterus. She delivered a female child of 1.9 kg with an Apgar of 9/10. 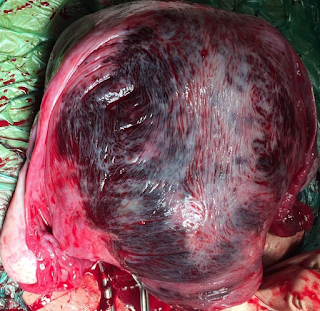 Placenta was posterior and around 630 gm of clots were seen from behind the placenta (concealed abruption). 40% of the placental surface was separated. They were old clots and the placental surface that was seen looked normal. No hematoma was seen extending into the broad ligament. Bilateral tubes and ovaries were normal. There was no hemoperitoneum. Uterine incision was closed and intravenous oxytocin was given (20 units in 500 ml Ringer Lactate). Uterus was well contracted. Hemostasis was achieved and abdomen was closed. Post operatively one unit of whole blood was transfused and rest of her recovery was uneventful. Abruption commonly presents with acute symptoms of abdominal pain and vaginal bleeding, however, 10-20 % of the cases present with only preterm labor with no or scanty vaginal bleeding. The classical triad of abdominal pain, vaginal bleeding and uterine hypertonus is present in only 10 % cases of abruption. Although acute and chronic abruption has not been defined explicitly, sudden and > 50 % separation of the placenta leads to sudden fetal death. However, if the process is chronic and self limiting, the fetus might survive as compensatory mechanisms act. In our case, as it was a couvelaire uterus, resulting in increased uterine tone the presentation could not be delineated and so luckily, she was sent for a USG to confirm lie and presentation that picked up the retroplacental clot. 40% of the placenta had separated and a clot was seen thus the process might have started 5 days back when she got admitted as a case of threatened preterm. It went undiagnosed at that time and as the symptoms subsided she took discharge against medical advice. The process restarted and then as she developed pain again she came back to the hospital. As it was a chronic process, the feto-placental insufficiency set in slowly and hence the kick count (which is a subjective parameter) was not affected but the non stress test was non reactive. Thus, in cases of chronic abruption, the patient can present with non-specific symptoms, with a normal coagulation profile and stable vital parameters. In cases of concealed abruption, abdominal pain rather than vaginal bleeding is ominous as large surface area of the placenta may be separated resulting in underlying fetal distress as it was seen in our patient. If chronic abruption develops in the second trimester it leads to the development of Chronic Abruption Oligohydramnios Sequence (CAOS) in 60% patients. This sequence is characterized by vaginal bleeding, oligohydramnios and intact membranes. However in our patient the abruption was seen at a later gestational age and there was no evidence of any recent vaginal bleeding or oligohydramnios. In our case as the abruption happened in 3rd trimester, and timely steroid doses were administered the neonatal outcome was good. The symptoms of abruption also depend on the location of the placenta. In a retrospective study done by Suzuki comparing the outcomes of abruption in anteriorly versus posteriorly implanted placentas, it has been observed that vaginal bleeding, abdominal pain and non- reassuring fetal heart status; all are less seen with posteriorly located placentas. Thus, posteriorly placed placentas can be silent killers. Also, the need for blood transfusion, chances of DIC and blood loss are less in posterior placental abruptions’ signifying that they are less severe. Couvelaire uterus or uteroplacental apoplexy is a severe form of abruption where there is widespread extravasation of blood into the uterine musculature and beneath the serosa. Incidences of hemoperitoneum caused due to abruption with seepage of blood through the fallopian tube have also been reported. Couvelaire uterus can only be diagnosed intraoperatively and confirmed on histology, hence its true incidence is not known. However, it complicates 5% of the cases of abruption. A study of 17 cases of couvelaire uterus in severe abruption by Cheng et al stated that the risk of post partum hemorrhage, hemorrhagic shock, disseminated intravascular coagulation, intrauterine fetal demise and neonatal asphyxia and demise is more with couvelaire uterus and abruption versus only abruption. In olden days couvelaire uterus mandated hysterectomy, however now it is well known that the condition resolves on its own. Thus, chronic abruption is usually a radiological diagnosis and needs prompt delivery of the baby. This silent condition can be a catastrophe in waiting, if prompt diagnosis and delivery and not done as hypoxic injury to the fetus or decompensation of the mother can occur. Ananth CV, Kinzler WL. Placental abruption: Clinical features and diagnosis. Available from: https://www.uptodate.com/contents/placental-abruption-clinical-features-and-diagnosis. Bertholdt C, Vincent-Rohfritsch A, Tsatsaris V, Goffinet F. Placental Abruption Revealed by Hemoperitoneum: A Case Report. Am J Perinatol Rep 2016;6(4):e424-e426. Deering SH. Abruptio Placentae. Available from: https://emedicine.medscape.com/article/252810-overview#a3. Mei Y, Lin Y. Clinical significance of primary symptoms in women with placental abruption. J Matern Fetal Neonatal Med. 2017; Jul 6:1-4. Elliott JP, Gilpin B, Strong TH Jr, Finberg HJ. Chronic Abruption- Oligohydramnios Sequence. The Journal of reproductive medicine.1998; 43(5):418-422. Nagayama C and Suzuki S. Influence of placental position on outcome in patients with placental abruption. J Nippon Med Sch. 2006;73(60):351-353.